The Ranger® R6SS is an X-Band ground-surveillance radar specifically designed to detect and track personnel and vehicles within a 10 kilometer range, all in a small rugged man portable package. It provides a stationary scan sector of ± 45 degrees, or can rotate continuously. With its advanced digital beam-forming and a high-speed refresh rate, the Ranger R6SS has class leading target detection and acquisition and classification as well as clutter rejection. 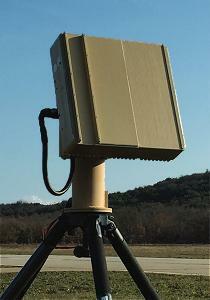 With built-in North-finding and GPS capabilities, it can be mounted on a vehicle or dismounted and carried for artillery and mortar fire correction. The manufacturer claims, that it can be used for Drone detection at 3.2 kilometres.